From our brief history of collecting solar data we know the magnetic field that creates sunspots and prominences can be awesome. 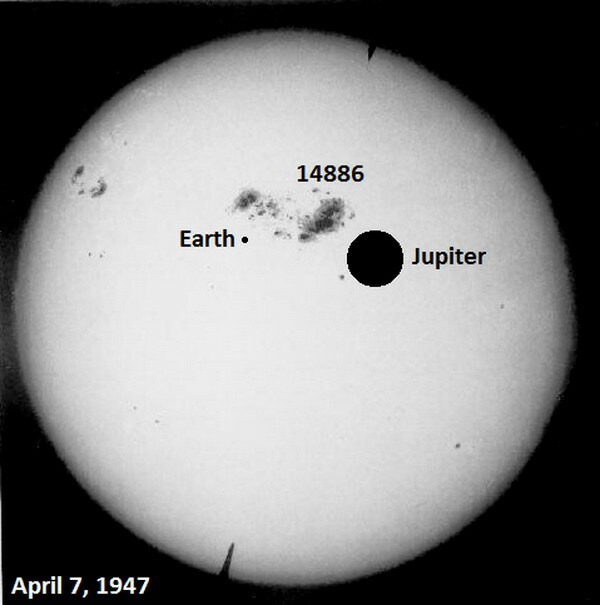 The largest film-recorded sunspot was on April 7, 1947. The size of this sunspot dwarfed Earth and was lager in extent than Jupiter, which itself is 11 times larger than the Earth (see below pic). This active region (AR) 14886 was in fact 3 times larger than AR9393, the large sunspot that triggered a geomagnetic storm in March 1989 that knocked out much of Canada’s power grid. Incidentally, the NASA Kepler Mission can discern good sized sunspots on distant stars by the variation in light output and has indeed found exo-sunspots in its search for exo-planets. Last month’s article on sunspots noted that, despite being dark, sunspots are semi-transparent “holes” that are less dense compared to the surrounding photosphere. This is because the presence of a magnetic field quenches convection (heat transfer) leaving a sunspot about 2000K cooler relative to the surround. Now we will take a look at why the internal magnetic field breaks through the photosphere and why our sun has sunspots in the first place. At solar minimum there can be zero sunspots over the course of months. There is also minimal plage, prominences and solar flares. At minimum, the internal solar magnetic field is normal, stable, with a definable magnetic north and south pole. The field lines look like diagram 1 in the figures to the left. The sun however is not solid and these field lines don’t stay fixed. They are connected and move with the plasma (think current) which in turn moves with the rotational forces of the sun. Around the equator of the sun the period of rotation of this plasma is 25 days and is faster than the period of rotation of plasma at latitude +/- 60°, 31 days, and faster still than the period of rotation at the poles, 36 days. This in turn causes the field lines to twist (diagram 2 on the left). Over the course of an 11 years cycle, this twisting continues until the differential or non-uniform rotation of the sun (both in latitude and depth) causes the field lines to buckle and loop as shown in diagram 3 on the left. 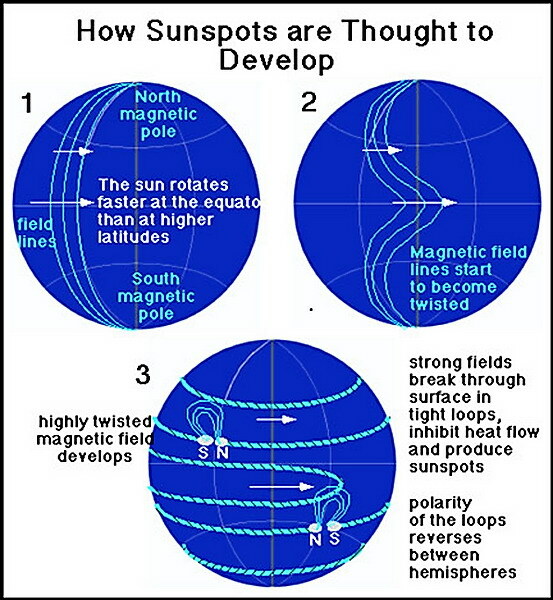 Recent research shows that meridional circulation along with solar rotation determines at what latitude and extent and duration sunspots may form and poke through the photosphere. Meridional circulation in turn is caused by variation in radiative temperature at the equator verses the poles. Hot gas tends to rise, migrate to the cooler polar regions where it cools and sinks. Each sunspot cycle opens with spots forming at latitudes around 35° North and South of the Sun’s equator, and as the cycle progresses, spots form closer to the equator in both hemispheres. The maximum number of spots form when sunspots are forming at latitudes around 25° in both hemispheres. When the last spots of a cycle are forming near 5° North or South, a few spots again form at latitudes around +/- 35° heralding the beginning of a new cycle. If it were not for solar rotation and the convection zone, we would not have many sunspots. 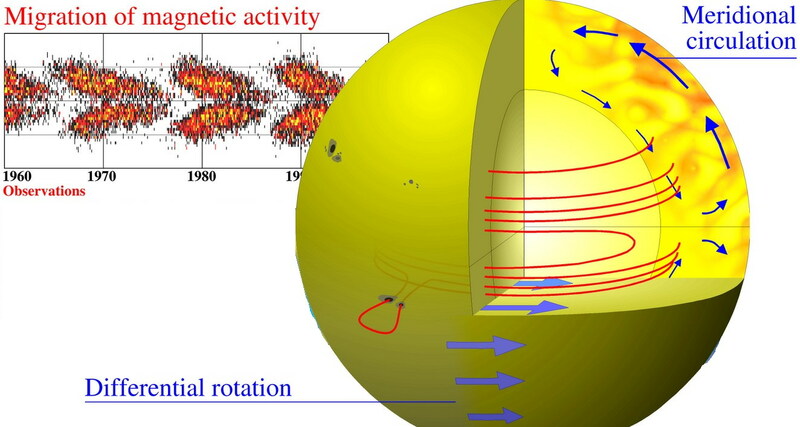 The differential rotation causes the magnetic field lines to twist and loop through the convection zone where the field impedes heat transfer to the photosphere. However, if our star was 1.3 times more massive we would not see as many sunspots either. In this case the stellar core temperature is 15 million degrees Kelvin and the self-maintaining CNO chain of fusion starts occurring over the proton–proton chain. And at this temperature the convection zone is no longer just under the photosphere but deep in stellar interior next to the core! More information on the sunspot formation is at http://solarscience.msfc.nasa.gov/dynamo.shtml.